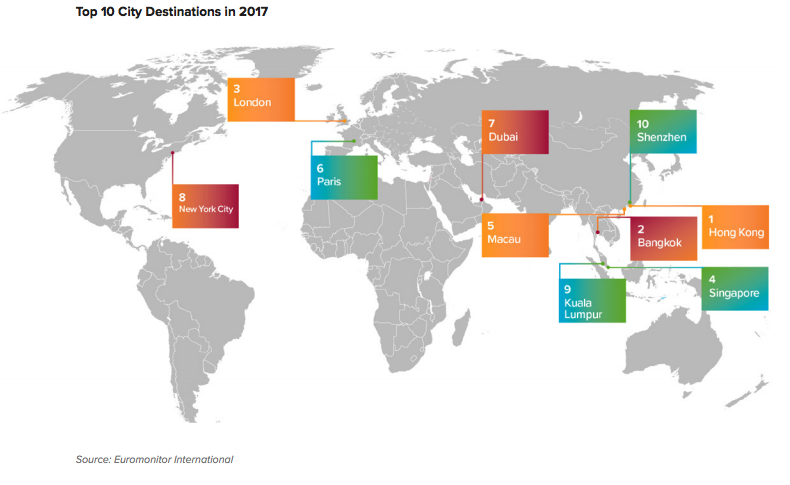 New York City and London both experienced strong growth in international tourism in the last year, ranking among the most popular destinations in the world, according to a new report from market research firm Euromonitor. The company’s annual “Top City Destinations” report shows continued strong growth for coastal destinations in the U.S. with New York leading the way as the only U.S. city in the worldwide top 10. The cities inbound visits increased by 3.1% from 2017 to 13,500,000 international visitors. Growth in London was even more impressive. Coming in as the number three city on the list, London brought in 20,715,900 international visitors, an incredible 4.5% increase from the previous year. Los Angeles accelerated growth this year as well, with a 1.1% increase to 7,246,400 visitors and Orlando and San Francisco also experienced growth in this area. Miami and Las Vegas both rank in the top US cities but saw their numbers dip from the previous year—Las Vegas by 1.3%. Four of the top five cities can all be found in and around Southeast Asia—Hong Kong, Bangkok, Singapore, and Macau.